Cut beef to 2.5cm / 1" squares, add to pan and fry until browned. Add the ale, stir well, and then simmer for 20 minutes. 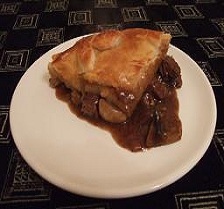 Peel and quarter mushrooms and stir into beef mixture. Heat the oil in one of the saucepans. Soften onions in the oil. Trim excess fat from the beef then add to the onions. When the beef is lightly browned add the stock cubes, herbs and pepper. Stir well before stirring in the water. Simmer gently for a few minutes. Cut mushrooms in half and add to the pan. Add a little cold water to the gravy browning then stir into the beef mixture. Put some water in the remaining saucepan and place over a high heat. Mix the flour, suet and pepper together. Slowly add cold water and bring together with your hands until you have a firm dough. Save ¼ of the dough to make a lid. Use the larger portion of dough to line the pudding basin. Pour in the meat mixture to just below the rim. 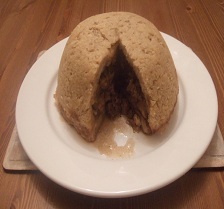 Flatten the remaining dough to a circle large enough to cover the top of the pudding. Press the edges together to seal it. Cover the top with a double layer of greaseproof paper then cover this with foil. Place in the steamer with a lid on. Steam over hot water for 2 hours, checking the water level regularly to ensure it does not boil dry (always add hot water not cold). Peel and dice the carrots and potatoes and top and tail the green beans and half. Cook the carrots and potatoes in the medium saucepan until they soften a little. Peel and quarter the mushrooms and stir into beef mixture along with the vegetables. Pre-heat the oven to 140°c / 275°f / Gas Mark 1. Cut the beef into 2.5cm/1" cubes. Fry the beef in 2 Tbsp of olive oil in the large saucepan (you will need to do this in batches otherwise the meat will just broil). After each batch has browned, remove it to a plate using the slotted spoon. Slice the cooking onions finely. When browned, add the onions. Sprinkle flour over the meat and onions. Stir well to soak up all the juices. Slowly pour wine into saucepan, keep stirring to avoid lumps. Now add the herbs and pepper. Put the lid on and cook in the oven for 2 hours. After the 2 hours is up, peel and trim shallots. Fry the shallots in the frying pan in 1 Tbsp olive oil for 5 minutes. Wash mushrooms and trim stalks. Remove large saucepan from oven and add button mushrooms and shallots. Stir well and return to oven with lid on. Chop chorizo into small cubes and add to pan. Saute for a few minutes then add the mince. Season well with black pepper and stir well to coat the meat. (If you like a really rich sauce add half a bottle of cheap red wine after the meat is coated). Pour in tinned tomatoes, the remaining herbs, the tomato puree and stir well. Simmer for a further 10-15 minutes (20 mins longer to cook in the wine if added). If using chorizo, slice and then cut into small cubes and add to pan. 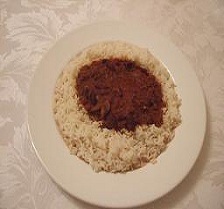 Cook until the mince has browned. Add finely chopped garlic, saute for a few minutes. Add mince and fry until browned. Add stock cubes, pepper, herbs and water from the potatoes. Mix well and then simmer for 10 minutes. Peel and slice mushrooms and stir in to mince mixture. 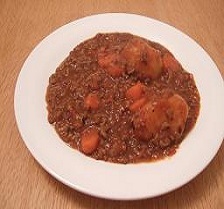 Mix gravy browning with a little cold water and pour slowly into mince, stirring constantly. Mash potatoes with a little butter and milk. Season well with pepper. Spread over meat mixture and fluff the top of the mash with a fork. Place sliced tomatoes on top, sprinkle grated cheese and more black pepper. 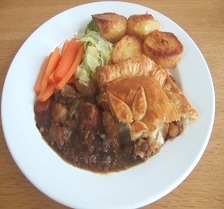 Serve with seasonal vegetables and gravy or chips and beans. Cut the beef into 5cm / 2" squares. Fry in 2 Tbsp olive oil in the large saucepan. You will need to do this in batches otherwise the meat will just broil. Add 1 Tbsp olive oil to the saucepan and fry the onions. 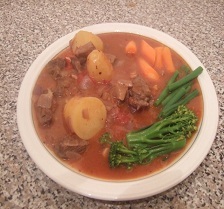 Return beef to saucepan with any juices that have leaked from the meat. Sprinkle paprika and flour over the onions and meat and stir well to soak up all the juices. 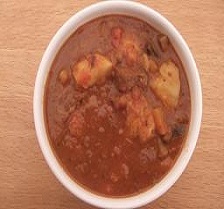 Stir in crumbled stock cubes, and then add the tomatoes and water stirring all the time. Finally add the Italian seasoning and black pepper. Put the lid on and place in oven for 1 hour. Deseed and finely slice the peppers. Add to the saucepan, return to oven and cook for a further hour. Peel and trim the mushrooms and cut them into quarters. Add to the saucepan 15 minutes before serving. Serve with tagliatelle or boiled new potatoes. Finely chop the garlic and rosemary and add to the onions. Sauté for a few minutes then add the mince. 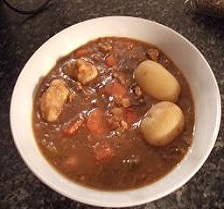 Cook until brown, add stock cubes, season well with black pepper and stir well to coat the meat. 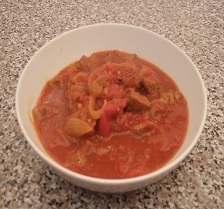 Pour in tinned tomatoes, the remaining herbs, the tomato puree and mushrooms and stir well. For the white sauce, put all ingredients, except parmesan in a saucepan over a medium heat. Add the parmesan and stir until dissolved. Take one third of the Bolognese and spread in the bottom of glass dish. 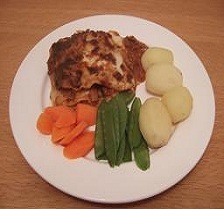 Spread one third of cheese sauce over lasagne. Repeat until you have used all the Bolognese and white sauce (white sauce must be at the top). Sprinkle with grated parmesan and more black pepper. Bake in oven for 40 minutes, then serve with season vegetables or chips. Keep any remaining lasagne sheets for next time. Chop onions finely and fry gently in one tablespoon of the olive oil until softened (if you do this with a lid on there is less chance of burning). When cooled add to mince with herbs and pepper. Beat egg and mix well into mince mixture with your hands. Shape mixture into balls, roughly 1½" or 4cm diameter. If eating without a sauce fry in remaining three tablespoons of olive oil until brown and drain well and serve with sides of your choice. Alternatively cover with cling film and refrigerate after forming the balls and when ready to use, add to a sauce of your choice and cook through slowly to infuse the flavour into the meatballs. 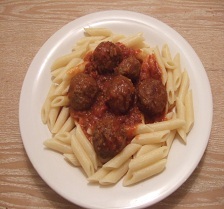 We stick the meatballs in a bolognese we are making so we get 2 meals. Also lovely in curries or anything with a sauce. Add hot water, simmer for 10 minutes. Trim excess fat from beef and cut into 2.5cm / 1" cubes. Fry beef in olive oil in the saucepan until browned. Peel potato and cut into quarters. Add lentils, potatoes, flour, and the hot water to the saucepan. Periodically remove any scum that forms on the surface of the liquid. Peel and thickly slice carrots. Peel and cube parsnip and swede. Add all vegetables to the pan. 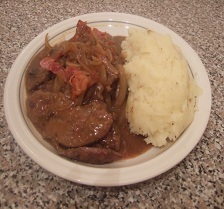 Remove the potatoes and mash and then return to pan to thicken the stew. Stir well and Simmer for a further half hour. If you are having with dumplings add these now. 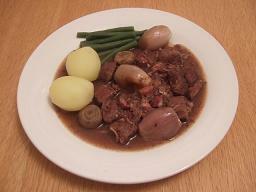 This stew is better if cooked the day prior to eating as it allows all the flavours to blend. Cook until brown then add the stock cubes, season well with black pepper and stir well to coat the meat. Add the tinned tomatoes, tomato puree and herbs and stir well. Peel and halve the potatoes and boil until soft (save a cup of the potato water). Peel and slice the carrots and boil until soft (save a cup of the carrot water). Add the potatoes and carrots and the water you saved to the saucepan. Mix the gravy browning with a little cold water and add to the saucepan. Serve with broccoli or cauliflower florets. Trim excess fat off the beef and cut into strips about 1cm / ½” wide. Brown the beef on all sides and remove to a plate. Slice the onions and add to the saucepan. Finely chop the garlic and add to the pan. Return the beef (with any juices that have come out) to the pan. Add the mustard, beef stock cube and black pepper. Stir to coat the ingredients then add the wine and hot water. Put a lid on and simmer for 15-20 minutes. Slice the mushrooms and add to the pan with the soured cream. Stir well then leave to simmer for a further 10 minutes without a lid. Finely chop onions and fry in the olive oil until softened. Finely chop garlic and add to the onions. Finely dice chorizo and add to the onions. Now add the stock cube, tomatoes, water, paprika, herbs, and black pepper. Dice the mushrooms and stir into the mixture with the tomato puree. Cut the peppers in half, leaving the stalks on, and scoop out the seeds with a spoon. Fill each half with the mixture and place on the baking sheet. Sprinkle freshly grated parmesan on top and place in the centre of the oven. 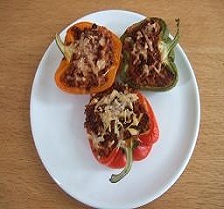 Bake until the peppers have softened and the topping has browned (30-40 minutes). Pre-heat oven to 230°c / 450°f / Gas Mark 8. Rinse fennel to cold and water. Slice in half horizontally and lay each half in the bottom of the saucepan. Stand a lamb shank on top of each piece of fennel. Pour in the wine and port. Add bay leaves, thyme and black pepper to taste. Put the lid on and place in the centre of oven. After 1 hour, peel and slice onions and fry gently in olive oil. Peel carrots and cut into 1cm / ½" chunks. Add carrots and shallots to saucepan. Replace lid and return to oven. After another hour, remove saucepan from oven and place the shanks and fennel in the ovenproof dish and place dish in the oven on a low heat. Bring to boil and reduce stock by about half. 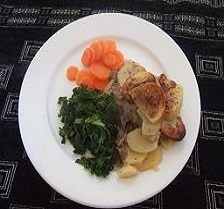 Remove lamb and fennel from oven and place on plates. 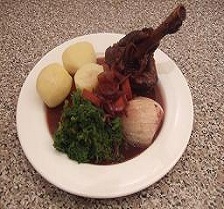 Pour reduced stock juices over the lamb. 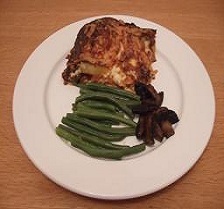 Serve with mashed or boiled potatoes and seasonal vegetables. Trim excess fat from the meat and cut into 2.5cm / 1” chunks. Fry the meat until it is brown on all sides (you will have to do this in batches). Remove meat to a plate when browned. Peel and chop the onions to roughly the same size as the meat. Fry in the meat juices until softened..
Peel and slice the garlic then add to the onions. Sprinkle the flour over the onions and stir in to soak up the juices. Slowly add the hot water, stirring all the time to make a sauce. Once the sauce is simmering, stir in the stock cubes, thyme and bay leaves. Add the meat, with any juices that have leaked out and the tin of tomatoes. Put a lid on and place in the oven for 1 hour. Scrape the skin from the new potatoes and cut any large ones in half. 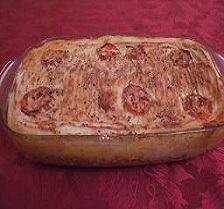 Remove casserole from oven and add the potatoes. Stir then return to the oven (with the lid on) for 45 minutes. 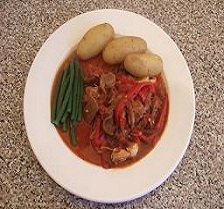 Check that the potatoes are cooked then serve with seasonal vegetables. Peel and slice the onions and fry over a medium heat in olive oil, until soft. Cut the lamb into 1" cubes, add to the pan and browned. Peel the carrots and cut in half lengthways then slice into half-moons and add to the pan. Peel the swede and cut into small cubes and add. Pour in tinned tomatoes and hot water. Crumble in stock cubes and add lentils, paprika, and herbs. Mix in tomato puree and a good amount of pepper. Bring to the boil then reduce the heat, put the lid on, and allow to simmer for 2-2½ hours. To make dumplings mix flour and suet with a few tablespoons of water to make a firm, pliable dough. Pre-heat the oven to 160°c / 320°f / Gas Mark 3. Mix flour, cayenne pepper, paprika and turmeric in the mixing bowl. Chop lamb into bite size chunks. Add lamb to flour mixture and coat well. 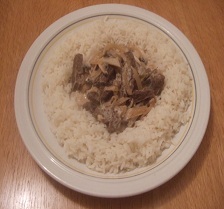 Fry meat in batches, removing to a plate when browned. Slice the onions finely, add to the saucepan and fry until softened. Finely chop garlic and add to the onions with the cinnamon. Crush the coriander seeds using the pestle and mortar. Add the remaining flour mixture, stock cubes, ginger and crushed coriander seeds. Stir well to coat the onions. Return the meat to pan along with any juices that have come out. Add the hot water and tomato puree and stir in well. Place in the oven for 1 hour. Remove from oven and stir well. Fry Onions gently in oil until softened. Trim any sinew from the liver and coat in a little of the flour. When onions have softened, remove to the casserole dish, leaving the oil in the pan. Fry the liver for 2-3 minutes on each side then add to casserole. You will need to do this in a few batches, add more oil if needed. Add the remaining flour to the juices in the pan and stir well to make a roux. Slowly add the water, stirring all the time. Add the stock cube and black pepper. Turn up the heat and continue stirring until the sauce has thickened. Pour over the liver, cover and place in the centre of the oven for 15 minutes. Fry the bacon and add to the casserole just before serving. Trim excess fat from the lamb and fry in the olive oil until nicely browned. Remove lamb to a plate. Remove gristle from kidneys and cut into 1cm / ½" pieces. Brown the kidney pieces in the lamb juices. Peel and slice the onions and add to the kidneys. Fry the onions until nicely softened. Peel the potatoes and cut into ½cm / ¼" slices. Crumble the stock cubes into the hot water and add the thyme and pepper to taste. Now arrange half of the potatoes in a layer at the bottom of the casserole dish. Arrange the lamb on top of this and spread the onion and kidney mixture over them. Pour over enough of the hot water mixture to just reach the top of the ingredients. Arrange a final layer of potatoes ensuring they overlap to cover the meat. Melt the butter in the saucepan and brush over the potatoes. Put the lid on the casserole and place in the top of the oven for 1½ hours. After this time, remove the lid and continue to cook for a further 45 minutes. If there is too much juice, remove some using a turkey baster (the juice will make an excellent gravy if you add a little gravy browning mixed with water). Chop onions finely and fry gently in 2 Tbsp olive oil in the large saucepan until softened. Finely chop the garlic and add to the onions; sauté for a few minutes then add the mince. 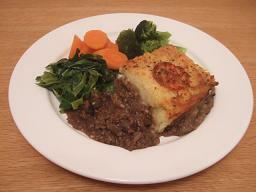 Cook mince until brown then drain off any excess liquid to remove the fat. Add the stock cubes, black pepper and cinnamon and stir well to coat the meat. Pour in tinned tomatoes, herbs and the tomato puree. Stir well and simmer for 20 mins to reduce, then remove from heat to cool. Peel potatoes and thickly slice potatoes and aubergine (eggplant). Fry slices in 3-4 Tbsp olive oil over a medium heat to brown, dry with kitchen roll for later use. Now is a good time to preheat the oven to 220°c / 425°f / gas mark 7. Add the cheees and stir until dissolved. Once all the cheese is melted into the sauce, add the beaten egg and nutmeg and stir well. Put about a third of the meat mixture into the glass dish and cover with a layer of potatoes and a third of the cheese sauce. Add another third of the meat mixture, cover with aubergines and a third of the cheese sauce. Add last of the meat mixture, cover with a layer of potatoes and the rest of the cheese sauce. 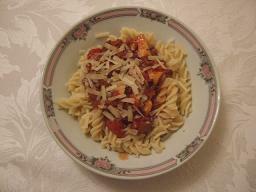 Garnish with the sliced tomatoes, 50g / 2oz grated cheese and some black pepper. 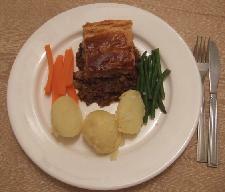 Cook in the centre of the oven for 60 minutes, then serve with seasonal vegetables. Add stock cubes, tomato puree, pepper, herbs and water from the potatoes.